Spring means shorter sleeves (at least in this part of the world), perfect time to show a bracelet. In winter I'll wear one, but it's often hidden by a sweater or jacket. Now through summer, bangles come out to play. Yes, they can clank, but to collectors, it's a sweet song. An arm full of bangles can recall nearly your entire life, if your collection began back when you did the Twist. Or you can wear a single, simple circle, your quiet claim to beauty– your pick. Bangles also make a marvelous gift; a woman doesn't have to do much besides slip one on and admire. 1. Tuck your thumb into the palm of your hand as if you were going to put a bangle on, then measure around the widest point with a tape measure. Pull the tape measure snugly while doing this. If you have a broad hand but a thin wrist, squish your fingers as closely in as possible, then measure, so that the bangle is not too big once it's on. 2. Take out your calculator and divide by 3.14. The result is the inner diameter your new bangle needs so that you can slide it on easily. 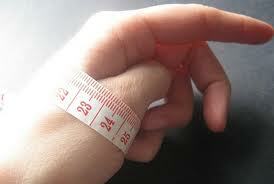 For hinged bangles, measure the circumference of your wrist and add an inch for ease. I love mixing bangles, and Jane Diaz' matte silver rectangular cut-out bangle would be a crisply chic addition to a collection. 3/16 inch wide; interior diameter 2 1/2 inches. Price, $88 from Twist Online. 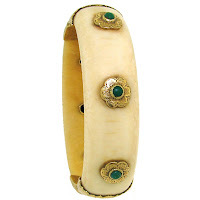 A rather perfect gift for any woman, if this diameter (a standard size for bangles) fits. A Bakelite-studded pink bangle set with pink sapphire and garnet would punctuate a more pedestrian stack. If you've got a slew of Madonna-homage rubber bangles, throw this baby into the middle and see how it gleams. Mark Davis Evelyn bangle, price, $1,640 at Twist. Wearers of gold bangles could add this 14k and ruby piece for a delicious polished detail. Quarter-inch bracelet set with cherry red rubies; $995 from Beladora2. John Iverson's minimalist grey bangle bracelet is a graceful shape that could stand alone. It's silver finished with a matte textured grey surface; site does not say but I suspect it's ruthenium, a durable dark-grey plating metal. Price, $190 from Twist. Then there's... this. An splash of yellow sapphires, in shades from canary to mandarin, covering three-quarters of the surface of a gunmetal silver Stardust Bracelet, edged in ivory enamel. Very Louise Brooks, mysterious and glamorous. Interior diameter, 2 1/4 inches. By MCL at Twist; price, $1,515 and I'm calling it worth every penny. 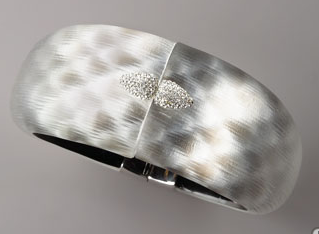 Alexis Bittar's python crystal bangle wraps your wrist in hand-panted lucite: soft shimmer and glow. Price, $375 from Bergdorf Goodman. A single lucite piece is pretty quiet to wear. 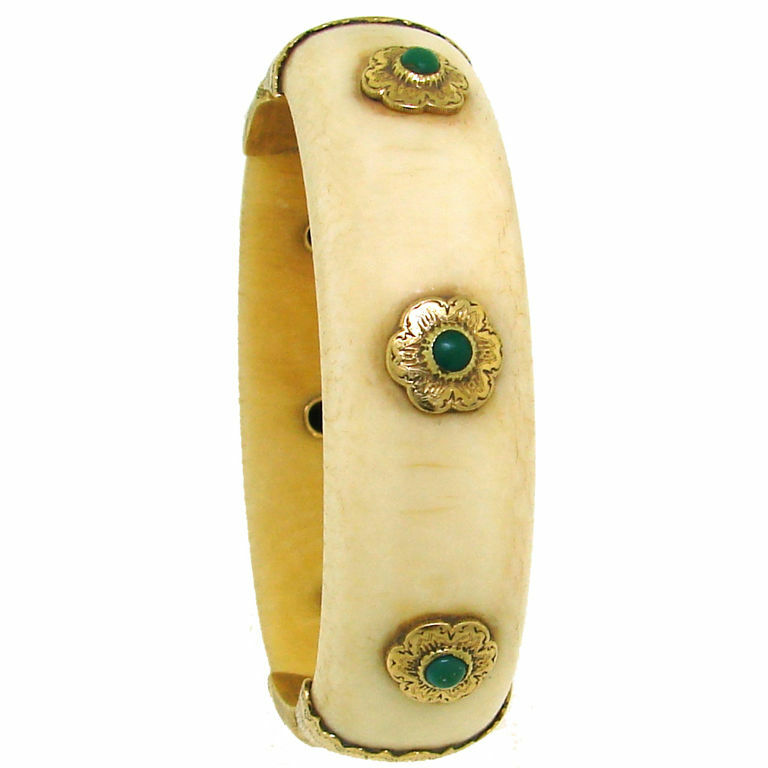 In the stratosphere, let us admire (fan self rapidly) a Buccellati ivory, turquoise and gold bangle from the 1950s, set in yellow gold. Madonna, didn't they make treasures? From 1st Dibs seller Nadine Krakov Collection; price, $12,500. Now step into your Aston Martin and roar off. Remember the add-a-pearl necklaces of the '50s? Bangles are the 21st century version, a personal collection built over time. 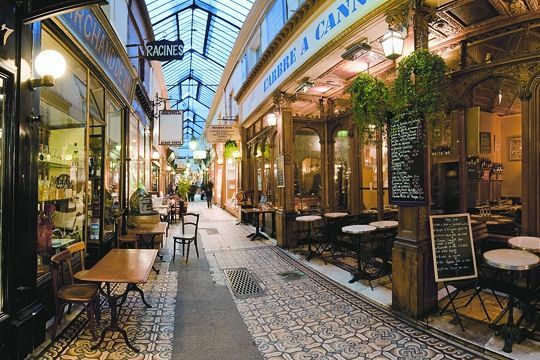 You can save for something special, hunt for flea-market finds, reroute from silver to gold and back again. But I still believe quality trumps quantity, so skip the throwaways and build a collection you can wear forever. Thank you so much for your exceptionally insightful blog. I love reading your posts!Will start looking at my bracelets to see what goes with what. I honestly never thought of combining them! I love the look (and sound) of a stack of bangles, but have a hard time finding them small enough not to slip off my hand/wrist, which is why I tend to look for hinged versions. I've seen so may Alexis Bittar pieces that I love, but haven't yet bought. Deja, we have the same body size problem again! My wrist size is 2 1/4, I rarely find bangles small enough to stay on. I like to wear bracelets, usually chain link that can be sized. I also have had better luck with solid bracelets with an opening that slip directly on to the wrist. Francie: My lovely gf Christine pairs bangles with her charm bracelet! All sorts of combinations work, even ones you think might not at first. Oh this post speaks to me...bangles are my go to bracelets. The tip about the size is fabulous...now perhaps I can order online instead of trying them on in the shop! Hostess: Yes, you have lovely ones! As a woman with a 7 inch wrist and large hands I have learned that one must be careful buying online and buying vintage - a lot of vintage Navajo and Taxco cuffs and bangles were made a bit small. Measure twice, buy once! Anon@11:44: Absolutely (which is why I showed how to measure). I've done that too! Really love the stacked look, no matter what age or stage. Two bracelet styles, the hinged bangle and open cuff, accommodate the larger hand/smaller wrist. I like the Italian one. I do wish people wouldn't wear multiple bangles to concerts though! May I add a plug for Scandanavian bangles? Nothing beats them for elegance! I have two Tone Vigeland bracelets that are oval shaped, with a bit of hammering that are a little bit "more" than a plain round bangle. Also I have a Georg Jension mobius bracelet that twists...fabulous simplicity! I love any kind of bracelet, and these bangles are inspiring! My favorite bangle features the Greek key pattern in "silver." Unfortunately, it's not really silver but just a cheap metal. I wish I could find a similar one in sterling. I guess I should look online, judging from the wonderful pieces you find there, Duchesse. 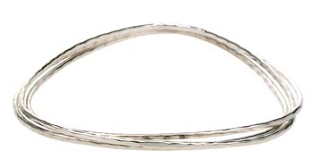 I'd also put it into your eBay search notifications; a Greek key silver bangle sold last month for about $16! Susan Tiner: I agree! Wonder if they become 'deaf' to their own bangles, like I cannot smell my perfume. Any extraneous sounds are annoying, but especially those a person could choose not to make, easily. Emma: What a great idea, a 'stopper' bangle! Love it, and thanks for the reference to Tone Vigeland. The Jensen Moebius bangle is on my someday list! 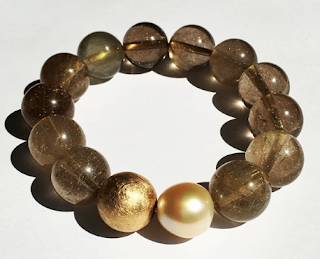 Love the Beladora bracelet. 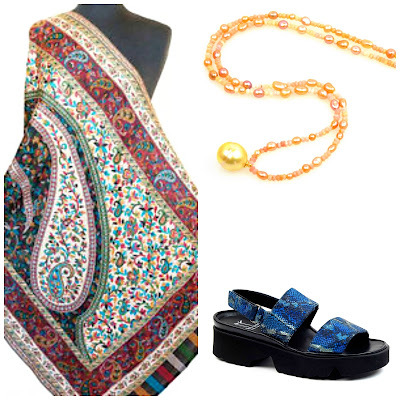 And I'll be wearing my Bittar tomorrow, and looking forward to it. What a great post Duchesse, thank you. I got my mobius bracelet (they come in medium and large) via an ebay auction from a seller called "jenseninvest". I paid a lot less than retail...and it arrived within a week in a lovely JG box! Gotta love that! Victorian era bracelets - like their 14" chokers - look out! They can be tiny! Find a favourite bangle and measure that and use it for reference. emma: I've seen various Moebius bangles on eBay, some genuine, some counterfeit. Yes, made in two sizes as are Hermes bangles. are fit: Any seller not listing diameter should be able to supply it. If you use the measuring method I've shown, then compare to bangle, yours will fit. Where people get in trouble is buying a bangle as a gift not knowing the recipient's size. LPC: That is one sumptuous bangle! I love bangles, I have several nice chunky bakelite (or Fakelite) bangles in lots of colors I love to wear. One of the memories of my childhood is a gift of some Indian glass bangles someone gave me. Now I'm here in So.Cal, it's easy to go to Little India and buy them - they are so cheap. The only tricky thing is to get the right size - if they're too small you'll break them. I so wish I could wear more bangles but I have a big wrist. I try to get bangles that have a hinge or are coiled. When is the accessories world going to understand big-wristed, wide-footed women have money they want to spend!! Carmie: Once again: jeweler. If you do not have good ones where you live, look on etsy, contact them to ask them to make one of their designs in your size. Where there is a jewelry will, there's a way. Wide feet are harder, there are not many bespoke shoemakers or manufacturers for pretty wide sizes. Aunt Snow: When I was in India I could not find one glass bangle in local markets to fit my average North American wrist. But here, in my local Little India, I can find them, made larger for export. Would you tell us where you found your Fakelite? Christine at 50: I swear!